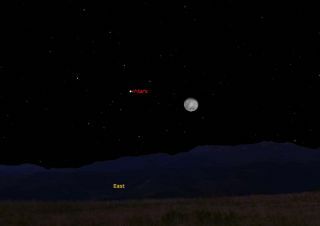 This sky map shows how the moon and Mars will appear together at 9 p.m. local time on Feb. 9, 2012 in the eastern sky as seen from mid-northern latitudes. Late Thursday night (Feb. 9), skywatchers who cast a glance toward the waning gibbous moon in the eastern sky will also notice the presence of a very bright, yellow-orange "star" shining with a steady glow hovering a bit above and to the moon's right. That's no star, though. It's the planet Mars. The apparent distance between the moon and Mars will be rather large, amounting to about 9 degrees. That's roughly equal to the width of your fist held at arm's length.The sky map of Mars and the moon for this story shows how they will appear Thursday night to skywatchers with clear skies. Mars is unmistakable once it rises in the east around 7:45 p.m. Its fiery-colored luster shines nearly twice as bright as the lighter-hued Arcturus star far to its lower left (Arcturus rises in the east-northeast a couple of hours after Mars). Mars currently shines at magnitude -0.8; excluding the moon, it is outshone in our current evening sky by only Venus, Jupiter and Sirius. Mars will reach aphelion — its farthest point from the sun — on Feb. 15, a distance of 1.666 astronomical units, which corresponds to a distance of 154.9 million miles (249.2 million km). That doesn't bode well for getting good views of Mars at its upcoming opposition on March 3. In fact, the red planet will appear little more than half as large as it did at its close approach to Earth in August 2003. Telescopes show Mars' disk growing by about 13 percent during this month, though it will still appear relatively small; when it comes to opposition in just over three weeks, observers will need an eyepiece magnifying 133-power to make it appear as large as the full moon does with the naked eye. Nonetheless, skywatchers should take this opportunity for some serious observing because Mars' apparent size is going to begin to slowly diminish by mid-March. It is currently late spring in Mars' northern hemisphere, equivalent to early June here on earth. In good telescopes, you might get a view of the shrinking polar cap appearing as a bright spot on the planet's disk. Wait until Mars is high in the southeast around 10:30 p.m. and start scrutinizing this most famous planet. It will reach its highest point in the sky in the south as it crosses the meridian soon after 2 a.m. local time. Late at night, as Mars rises high, note its exact position beneath the right-triangle pattern of stars that represents the lion’s hind quarters. The planet came to a standstill against the background stars on Jan. 23. Since that date, it has been in retrograde motion (moving westward) and is approaching the bright bluish star Regulus. Right now, the two are separated by 21 degrees, but they'll be less than 5 degrees apart on April 15, when Mars' retrograde motion comes to an end and it comes to a standstill again before reversing direction and heading back toward the east.